Our Chefs at Riggs Distributing, often try many holiday recipes on our Wolf products during our Showroom Saturdays (1:30pm every Saturday). Our guests (and team!) get the benefit these delicious dishes and provide inspiration for our own holiday feasts. The stuffing recipe by itself is delicious and uses the Wolf Convection Steam Oven on Convection Humid mode. With capers, white wine, prosciutto, parmesan, and traditional Mediterranean herbs, this stuffing provides the salty and savory contrast to the sweet cranberry sauce and sweet potatoes often found at the holiday table. 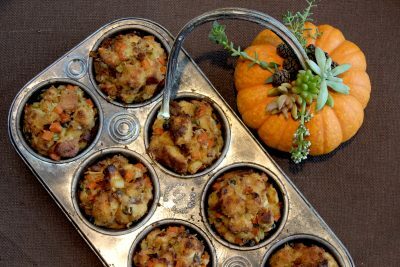 Turning the stuffing into “muffins” provides a new look to the table and helps give extra tender edges (often the most sought after part of the stuffing casserole) to more of the stuffing. Whether made traditionally or as a muffin, your guests will love this recipe. Click on the link for the recipe! How did you enjoy this recipe? Let us know in the comments!